Please refer to our stock # 1768 when inquiring. (D) 14 pc waistcoats all have riveted steel, dyed blue purple, pearl, multi piece construction. Please examine each image to appreciate! > $12 each USPS Priority/Ins/Track or Free with USA Ck or USPS MO. REPLY to AZ: Acceptable EACH when taking a minimum of three (total due: your offer -9 X 3) when sending your web store address and your Business Ck or USPS MO and I will pay for USPS Prior/Ins/Track. 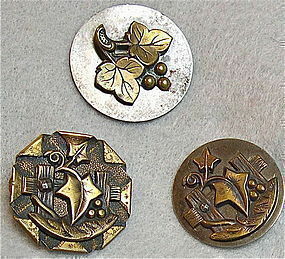 Note: Button dealers with your proof of biz or website - motivated here to extend generous fair multi purchase specials. Please inqiure.